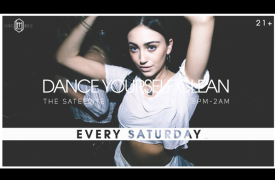 Dance Yourself Clean is an Indie Dance Party created by music lovers, for music lovers. What started as a small party in a tiny bar in Seattle has grown to a massive movement spanning the US from coast to coast. Playing Music by: LCD Soundsystem | CHVRCHES | BØRNS | Glass Animals | Charli XCX | MØ | Grimes | Elohim | Broods | Empire of The Sun | Purity Ring | Twin Shadow | Icona Pop | Sofi Tukker | Miike Snow | Bag Raiders | Powers | VHS Collection | Sylvan Esso | Arcade Fire | Robyn | Tove Lo | Cut Copy | Neon Indian | 1975 | Capital Cities | St. Lucia | Goldroom | Cherub | STRFKR | RAC | Little Dragon | Miami Horror | Purity Ring | Chromeo | Chairlift | NVDES | The Naked And Famous | Phoenix | MGMT | and many more.